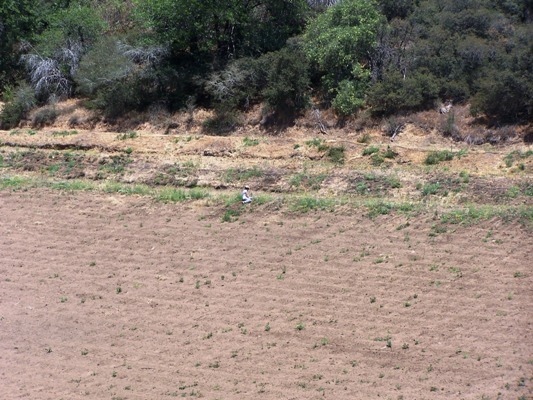 That white dot in the middle of the photo is my devoted, patient wife stripping root suckers off the apple trees we supplied for the expansion of the orchard at Riley’s Farm in Oak Glen back in 2007. It was a hot day and no shade, and we had about 300 trees to do. I’m not sure when she married me what she was in for, and she could also probably ding me for false advertising, as I had absolutely no interest in apples then. But back in 2007 she found herself out in the middle of the field pulling off side suckers, digging the ID tag out of the mud, and tying the sapling onto the bamboo stick on trees in someone else’s orchard (which is what happens when you marry an apple geek). But we were up there picking raspberries today, and the little baby trees are growing up; that’s them in the background behind the apples. They’re starting to bear and soon there will be happy families milling among the trees picking heirloom apples and savoring the tastes Thomas Jefferson and George Washington savored. It’s rewarding to see the fruit of our labor, a gift from God as stated by Solomon in Ecclesiastes. 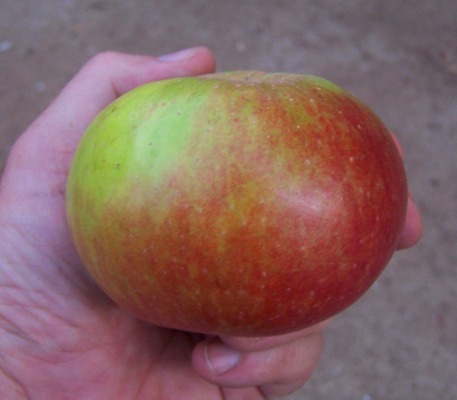 The Red Boskoop apples are honkin’ big this year. It’s weird to see them on my tiny M27 rootstock tree that’s about 3′ tall with a big load of these oversized apples on it. We’re getting a few early drops that had stings or cracks on them; crisp, juicy, way too zingy for fresh eating yet, but would probably make great pies and applesauce (with enough sugar!). 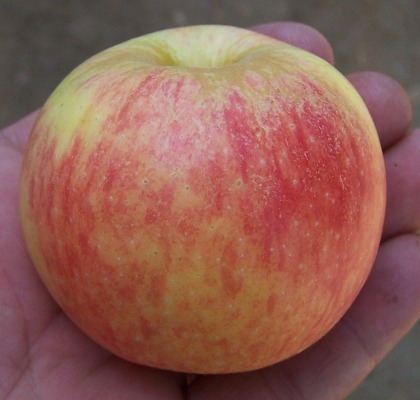 Anyone who thinks warm climate apples are sweet, mushy, and bland haven’t had one of these sour, hard apples bite back. The main crop ripens a bit later in the fall. I wish I had a full-sized tree of these. The Galas are starting to drop en masse off the tree; most have codling moth stings but some are sound and still dropping. The ones I can pick up before the sun bakes them are pretty good already, even if a bit green; they have a cinnamon aftertaste that is very “appley”. They have a good crunch and are quite juicy, and everyone I’ve shared a slice with today say it reminds them of how lousy the store apples are right now (they’re never that good even at their best). 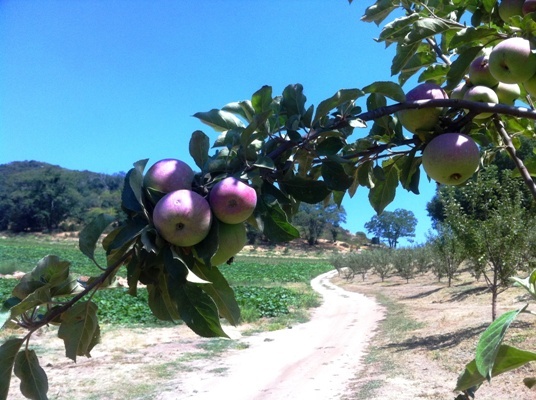 We’re still in the peach and plum mode to be thinking much of apples, but these Galas are a teaser of what’s to come. I hope a few hang on the tree to pump some more sugar and flavor in.